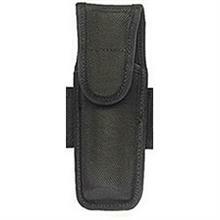 Covered OC/Mace pouch. AccuMold trilaminate construction with ballistic weave exterior and Coptex Knit lining. Full flap with exclusive Roll Top lid helps secure canister, dual web belt loop design accommodates both 2" and 2.25" belt widths.